If you are making your holiday menu, and checking it twice, be sure to add this delicious recipe for stuffing (or dressing as it is properly named – thanks, Kristi) that can be adapted to be yeast and sugar free! So deck the halls and enjoy your family, friends and food during this festive season! Preheat oven to 325 degrees. Mix all of the ingredients together, and pour into a greased 8×8 pan. Bake for approximately 45 minutes or until golden brown. This entry was posted in Recipes - Bread and tagged Cane sugar free, dressing, Holiday menu, Onion free, Stuffing, Turkey, Yeast free. Bookmark the permalink. How I really wish I have an oven coz if I would have, I will baked a lot of cakes and pastries non stop… Sigh day dreaming btw my FTF is up, thanks! 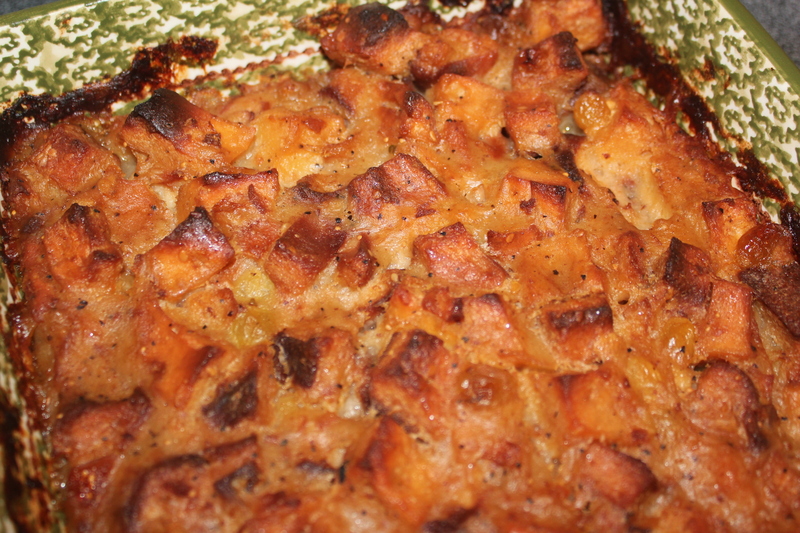 This is a very flavorful stuffing, I just love the Apples and Raisin combination. It looks delicious! Thank you so much for sharing with Full Plate Thursday. Wishing you and your family a very Happy New Year and Abundant Blessings in 2012! yum and looks very delish, makes me drool 🙂 Visiting for Food Trip Friday, hope that you can return the favor too.